28 SMT Magazine • October 2015 the pressure of the blade on the stencil until the residue disappears. The second experiment to reduce print pro- cess cycle time is to examine how often you clean the bottom side of the stencil. This is commonly referred to as wipe frequency. Clean- ing the stencil removes solder paste that may be building up in the apertures. It also removes any paste that may be trapped under the stencil, waiting to be transfer printed to an undesired place on the circuit card, later to be blamed as a spatter. The cleaning sequence may take 15–30 or more seconds. 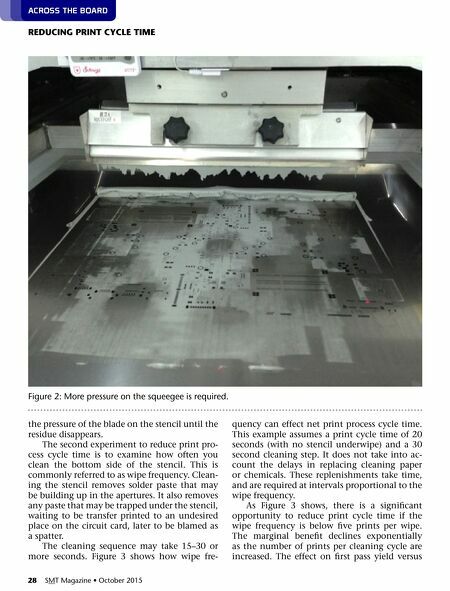 Figure 3 shows how wipe fre- quency can effect net print process cycle time. This example assumes a print cycle time of 20 seconds (with no stencil underwipe) and a 30 second cleaning step. It does not take into ac- count the delays in replacing cleaning paper or chemicals. These replenishments take time, and are required at intervals proportional to the wipe frequency. 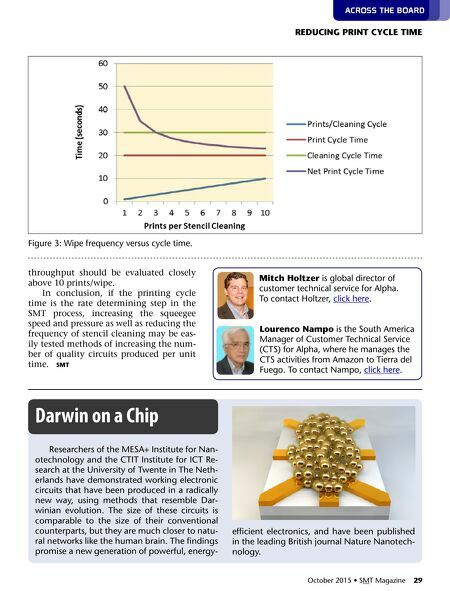 As Figure 3 shows, there is a significant opportunity to reduce print cycle time if the wipe frequency is below five prints per wipe. The marginal benefit declines exponentially as the number of prints per cleaning cycle are increased. The effect on first pass yield versus ACrOss The bOArd reducInG PrInt cycLe tIMe figure 2: More pressure on the squeegee is required.